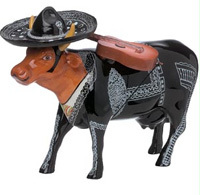 Mooriachi | CowParade Retired Figurines | One Price Low Flat Shipping! From the CowParade Retired Cows Collection, Mooriachi. Designed by artist, Familia Masterson. Featured at the CowParade San Antonio 2001. Made of ceramic. Measures 4" x 6"
Mooriachi cow is a caricature of the classic Mexican guitar playing Mariachi. He is wearing a sombrero and has his guitar slung over his shoulder.